Various events have transpired against me maintaining momentum with the renovation of ‘Minnow’. 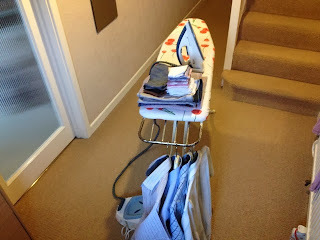 Today, shopping, housework and tiredness sapped any enthusiasm I had for continuing the work. Rain and dismal weather contributed to my lack of motivation - even for spending a quarter-of-an-hour working on ‘Minnow’. Winter is on the doorstep, followed by spring, but unless I can regain momentum, ‘Minnow’ may not be ready for an early outing next year. 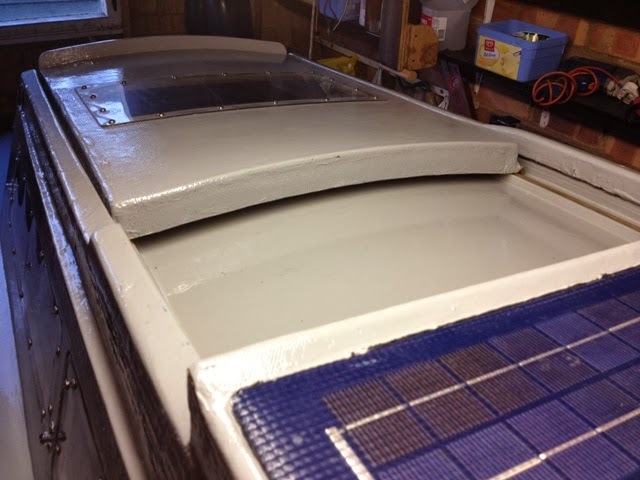 Weather plays an important part in my progress, because my garage is not insulated against the cold, and for the most part I require the door open for setting up my Black and Decker workbench. 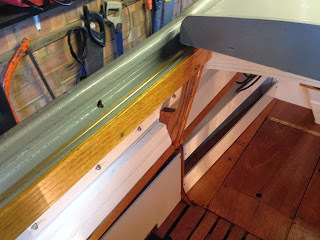 There isn’t enough room in the garage for the bench when the door is closed. 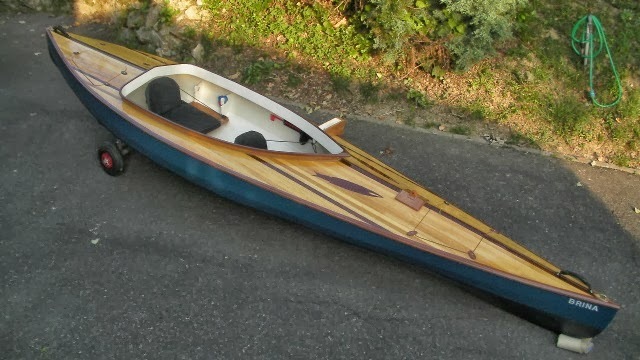 Essentially, the majority of items I make for the boat are shaped and assembled on the bench which I place in the open by the garage doorway. With cold weather approaching, my prospects of rapid progress are remote, but whenever I can motivate myself and conditions are suitable, I shall endeavour to carry on the good work. Despite my optimism of yesterday, events conspired against me working on ‘Minnow’. I had forgotten that one of our great grandsons would be doing a sleep-in, and today he would require the full attention of my wife and me. 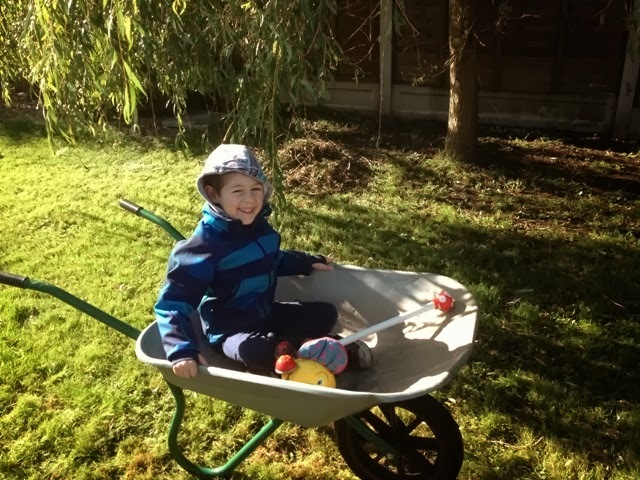 He is an engaging and extremely active boy – profusely inquisitive, wanting to explore everything he sees by handling it and asking questions of adults who must come up with answers. One job that had to be done was fitting the remaining fence panels into their support posts. My wife insisted that she would assist me in doing it. My immediate neighbours were unavailable, so I accepted her offer. 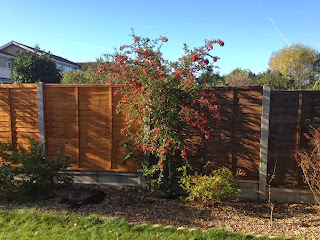 The first panel went in well, but the second was marginally too wide at the base. 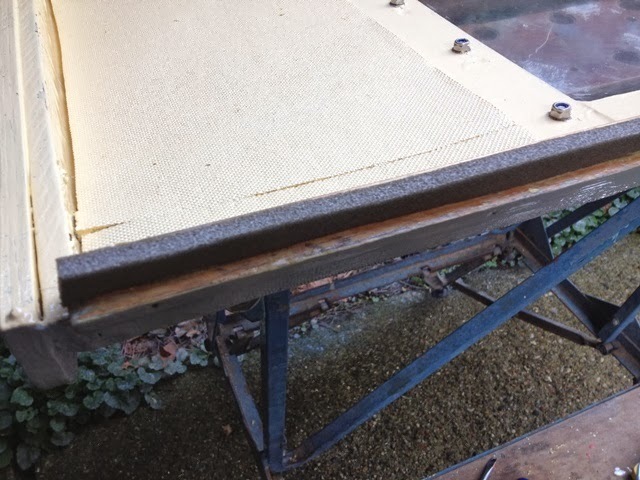 I was standing at the top of a step ladder; at the same time lifting and guiding the panel into vertical slots down the sides of the support posts, while my wife was lifting the panel from the base. Only then did we realize it was too wide to fit between the slots. 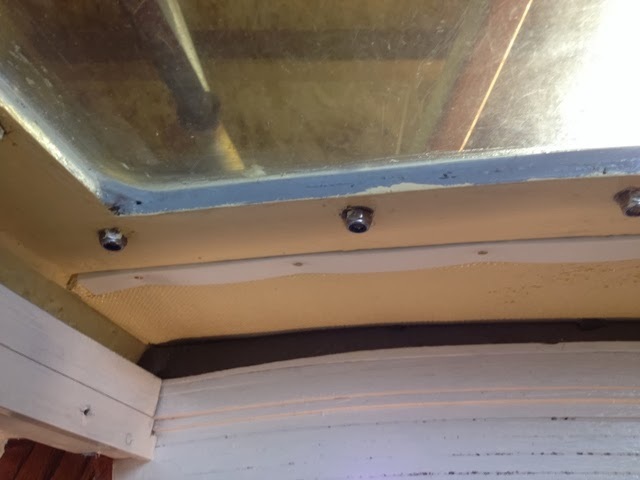 That was a dangerous moment, because one of the lower corners of the panel was engaged into its appropriate slot, while the other was balanced on top of the opposite post. 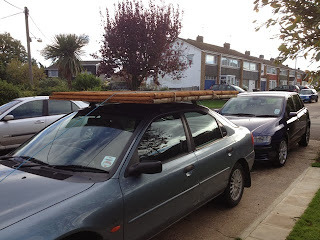 The panel could have toppled either way and perhaps have been damaged as a result of falling to the ground, but more to the point, it could have knocked me clean off the ladder or bashed my wife on the head! In that predicament we mustered enough strength to disengage the panel and lower it to the ground without mishap. 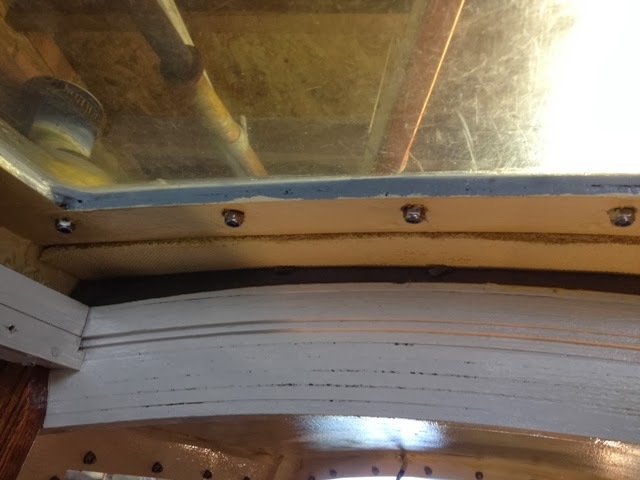 I reshaped the base of the panel with a plane, and a second attempt at putting it in place was successful, meanwhile our young visitor played with his toy vacuum cleaner well away from the danger area. 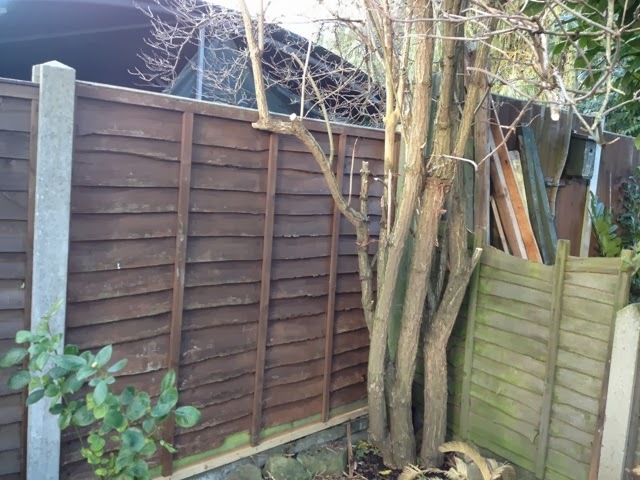 The reinstallation of the garden panels necessitated cutting down three small trees which left us with the problem of what to do with the cuttings. 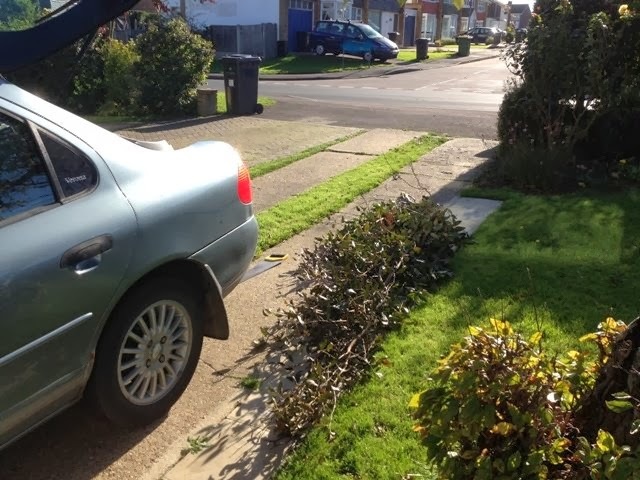 The foliage I took to the Council recycling plant and I cut the branches into small pieces to build a Guy Fawkes bonfire. Needless to say, our tiny helper played his part by collecting twigs and placing them on Guy’s pyre. Making his effigy will be fun. That disposed of the morning. For much of the afternoon we were stuck in a horrendous traffic jam on the A130 to the south of Chelmsford. 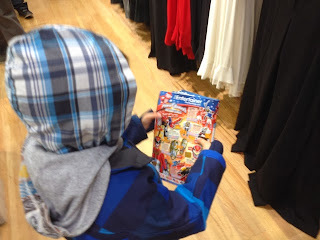 After delivering items to a grandson we visited a toy shop and two other shops of interest to my wife. Only then, could we return our young charge to his father before returning home. Nightfall was soon upon us. Time available for working on ‘Minnow’ of late has been in short supply. 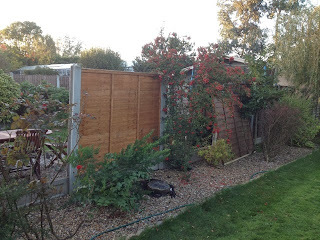 My priority was replacing fence panels that had been blown from their support posts during yesterday’s gale. Two of them were damaged beyond repair, but a third I was able to put right. Repairing it was not difficult, since I only had to remove the lower plank and exchange it for an undamaged one from a redundant panel. I was able to insert two panels into the slots of their support posts, but I shall require assistance for doing the others. Maybe tomorrow I’ll find time for working on ‘Minnow’. Early this morning the storm was at its peak. Four fence panels were blown out and others were weakened. I may be able to repair two of the blown out ones, but I’ll have to replace some that were damaged because they are rotten and they will not withstand another battering. What with doing various necessary things I was only able to put in 15 minutes applying a final coat of varnish to ‘Minnow’s’ stove unit. At least, by tomorrow the varnish will be dry, and maybe I’ll be able to start making a navigation table that can be clamped to the unit. Perhaps a separate general purpose table would be better. In less than a year I shall be an octogenarian, and I am conscious of how valuable time is. For every second that passes, my life that is left is less by the same. Today 15 minutes of 1,440 I set aside for improving ‘Minnow’. Why? Because she has become a part of my life, and I think she is worth it! For my own sanity, satisfaction and pleasure I think those 15 minutes spent on her were worth it for me. 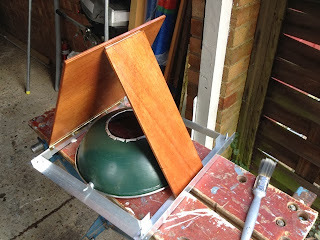 The exercise was simple: To varnish over the first coat of varnish I applied to ‘Minnow’s’ stove unit yesterday. Tomorrow (DV)* I’ll repeat the varnishing exercise – that’s assuming the garage in which ‘Minnow’ resides, remains standing, because widespread damaged is expected overnight and into the morning, on account of a fierce storm now battering the southwest of England which is heading towards Essex where I live. Forecasters predict that the worst of it will be fast-moving, and by early morning it will have moved to the southern part of the North Sea. Ephesians 5:16, 1 Peter 1:17, Psalm 39:4, 5, Psalm 89:46, 47, James 4:14, 17. Another hour-and-a-half saw me more or less finishing the gimbal unit. I put the first coat of varnish on the plywood. You’ll notice that there are two pieces of plywood – an upright piece for supporting the gimbal frame, and a horizontal piece for retaining the former. 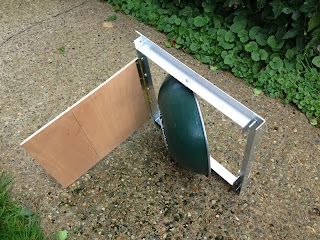 Both are hinged - the upright one to the gimbal frame and the horizontal one to the base of the upright one. 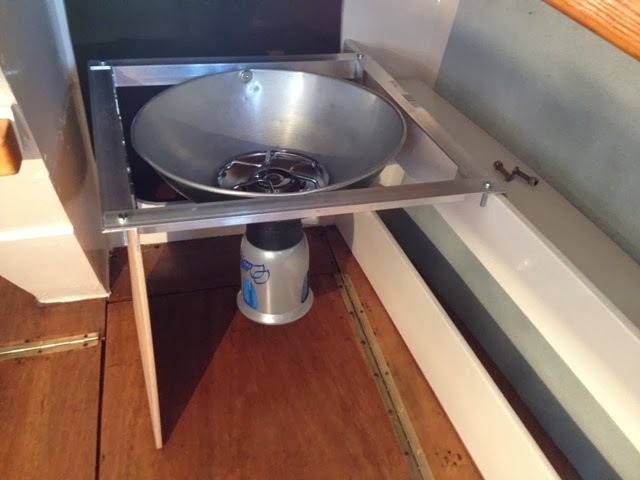 Because the pieces are hinged together the unit can be folded to occupy less space, and it can be stowed forward of the cabin or in the lazarette. 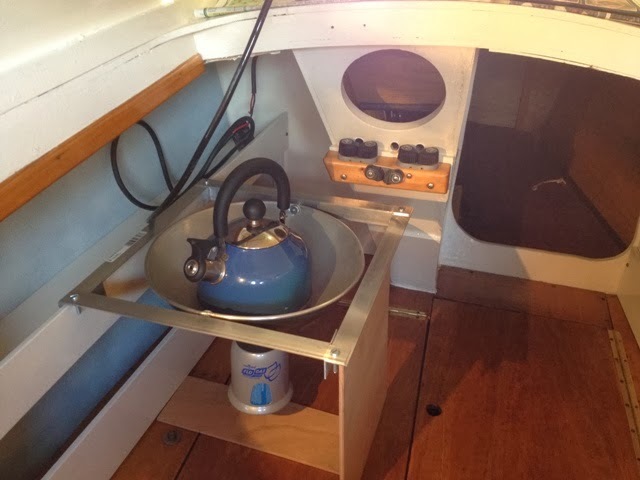 Setting it up takes but a few seconds, and it can be attached to the port or starboard sides of the cabin. If used when the boat is underway, the starboard side will be better than the port, because there it will be clear of the halyard, topping lift and furling line. When the boat is at anchor, the unit can be placed by the main vent. 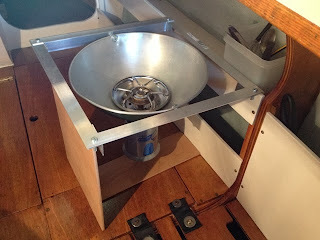 I believe the unit will work well, but I shall not know for sure until I try it when the boat is sailing. I’ll have a go at making a chart table that will fit on top of the unit where it will be very convenient for doing chart work. Today I had an hour-and-a-half to come up with a foolproof support for the gimbal. 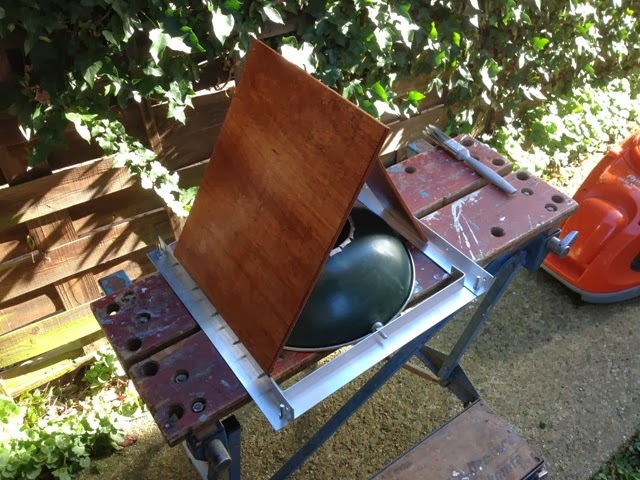 Well, I devised a drop-down hinged support made from plywood, but until I make a gismo to stop it from folding into the stored position, it will not be foolproof. I have in mind three solutions, and I must decide which will be the best. 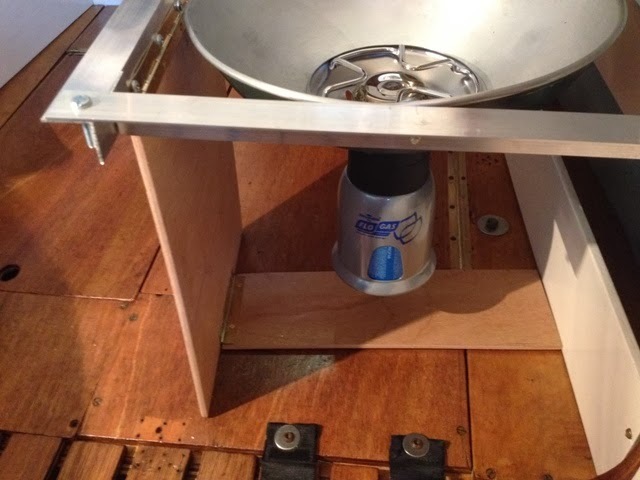 I had a shot at making a gimbal for my Euro Camping ‘Magic’ stove. 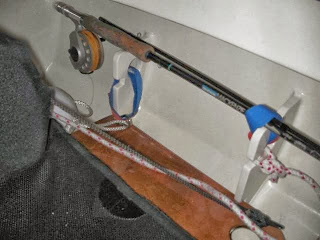 Instead of permanently keeping it in the lazarette I came up with the idea of storing it there, and for serious use have it in the cabin. 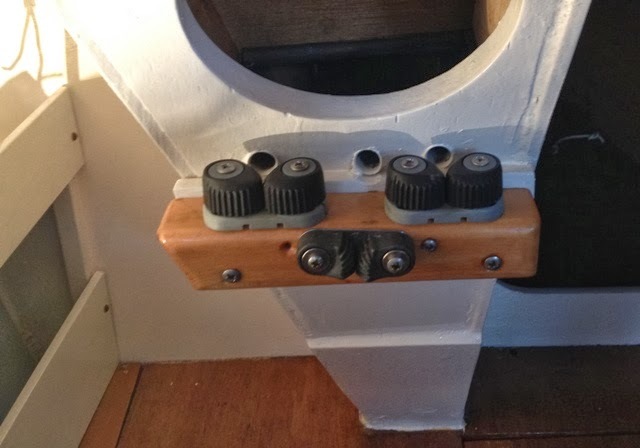 By latching the gimbal to the starboard side of the cabin I shall be able to cook in a more civilized fashion – even while sitting on the seat and facing forwards. 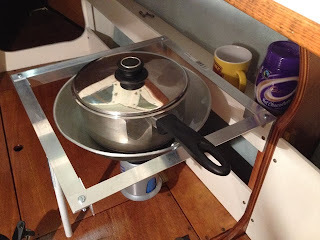 From past experience with 'Faith's' stove I found that when it was in the lazarette I could not easily reach it. 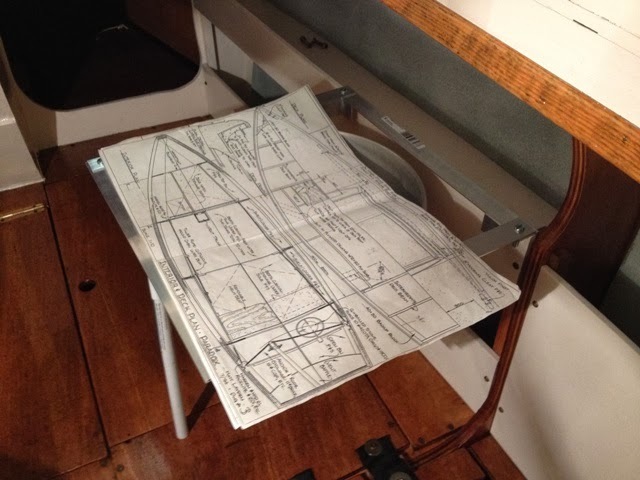 Another advantage of having the stove in the cabin is that I can place a chart table above it, but to do this I shall have to devise a locking system to prevent the gimbal from swinging to and fro; alternatively I could extract the stove and lock the table to the gimbal. I have yet to come up with a foolproof support for the inner side of the gimbal frame. A fold down support will be the strongest. If you are wondering where I obtained the aluminium bowl that supports the stove, I saved it from being thrown into the recycling bin! 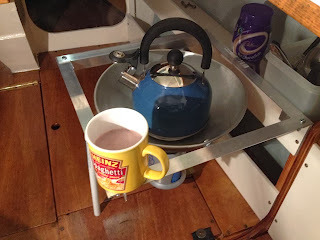 This evening, by way of testing the viability of the gimbal, I made my first hot drink. I’ve discovered that my cutlery container conveniently fits in the shelf by the stove. 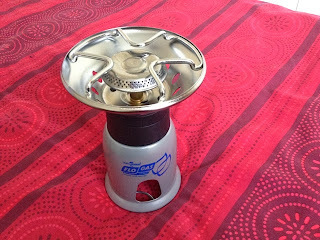 My next door neighbour who follows my blog, kindly gave me two Camping Gaz canisters. 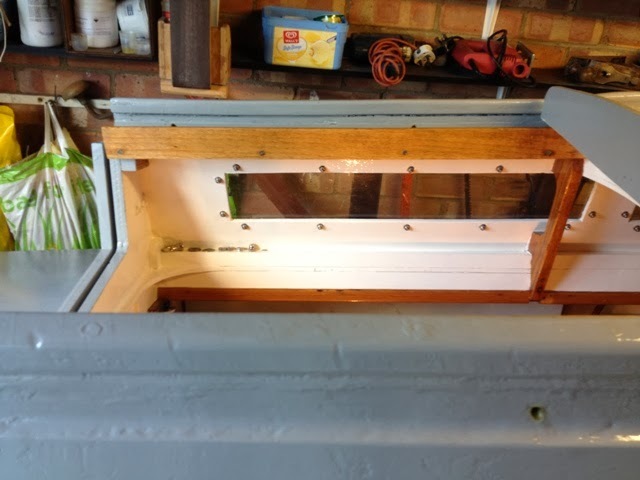 I put the finishing touches to ‘Minnow’s’ hatchway by adding wooden trim pieces either side of the hatch gate. 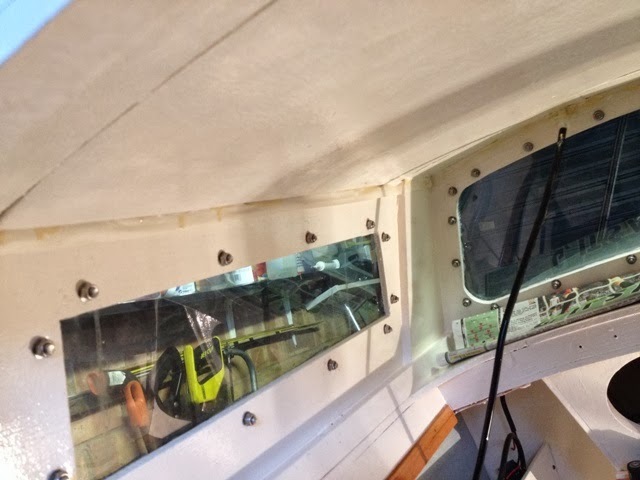 They very much improve the appearance of the boat and help keep water out of the cabin. I am about to start making a gimbal or gimbals for a Flow-Gas ‘Magic’ stove. I bought mine at a Camping and General sale for a bargain price of £5. The stove is fuelled by butane gas dispensed from 190 gram cartridges supplied by Euro Camping or Gamping Gaz. ‘Minnow’s’ hatch has been put in place, and I have almost finished installing it. This afternoon I added an external baffle to the front end. 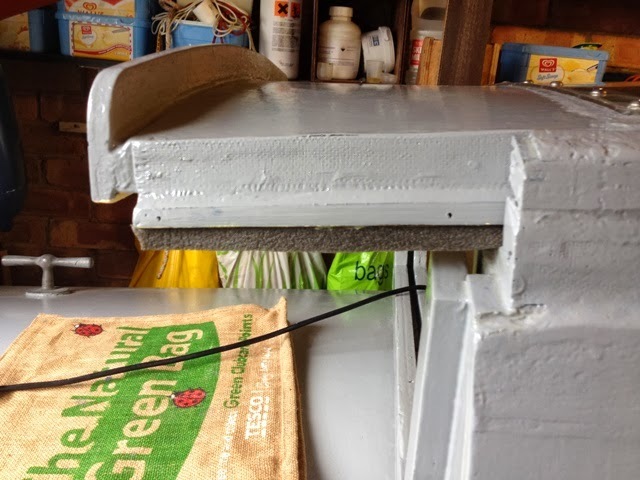 I made it from a draught excluder I bought at B & Q.
I discovered that when I opened and closed the hatch, both pieces of insulation foam under the lid snagged on the hatch gate baffle; therefore I cramped them to the lid with plastic edging strips. 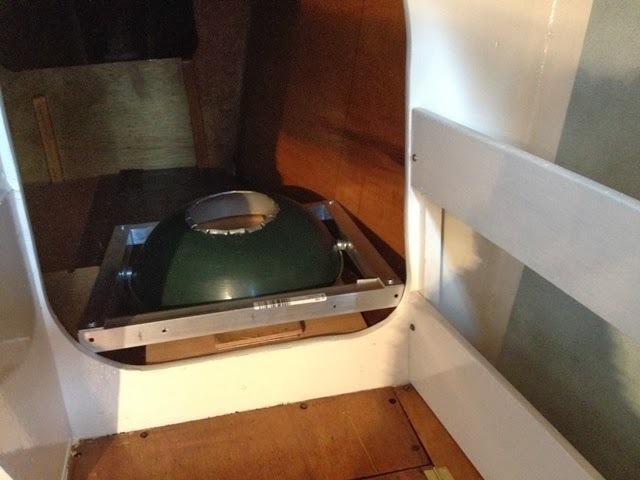 I’m quite pleased with the hatch, and I think it should be virtually watertight, even in the worst conditions when waves may break over the boat. Rainwater and spray should escape through the drain holes either side, or through gaps at the front and back between the outer retainer frames* and the hatch side seals. 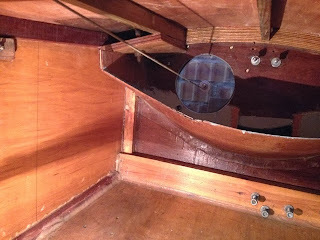 When I first looked at the boat, I thought quite a bit of work would be required to make her hatch satisfactory, and I wasn’t wrong. When I am able to take ‘Minnow’ outside, I’ll give the hatch a thorough test by sloshing water over it. *The retainer frames run fore and aft. Their purpose is to restrict vertical movement of the hatch. The hatch cannot move further forward than it should because of stops at the front end of the sliders, and it cannot slide off astern, because wooden trim strips either side of the hatch gateway act as stops. 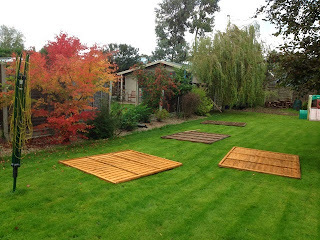 These bits of varnished wood have yet to be screwed and sealed in place. In addition to making the boat look more attractive, they will help keep water out. 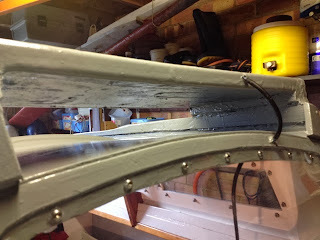 This afternoon I found time to make a start at re-housing ‘Minnow’s’ hatch. 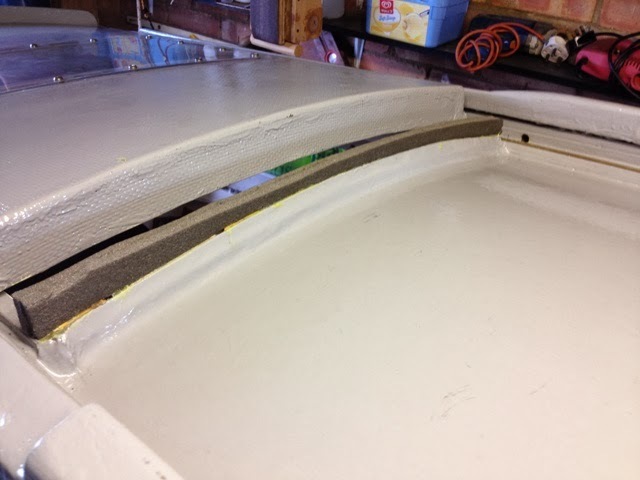 I was able to fit a foam baffle to the forward end of the hatch gate. I also glued strips of foam to the underside of the port and starboard hatch sides. These are for preventing water from entering the cabin when the boat is heeled. I have yet to make a baffle for the forward end of the hatch to prevent water from swishing over the top of the cabin as far as the hatch gate baffle. 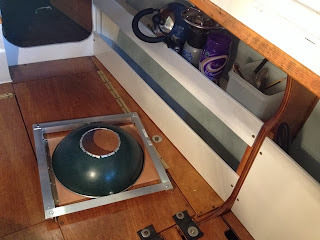 When everything is in place the hatch should virtually be waterproof. 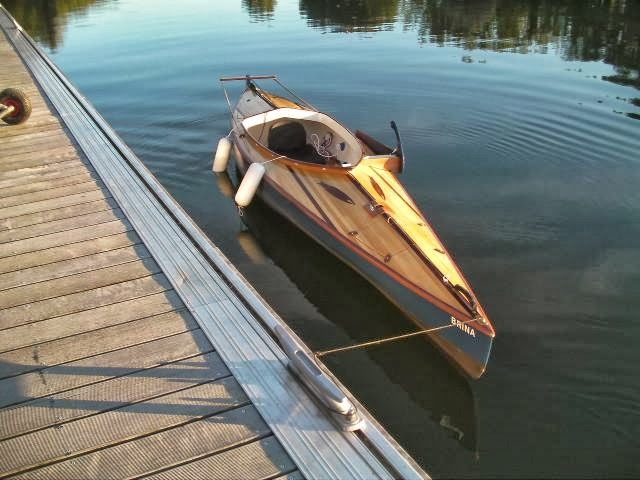 Richard Guziewicz, who lives in southwest France, recently sent me photos of a Paul Fisher 50/50 he built - I should say ‘crafted’, rather than built, for what he has done is a work of art. 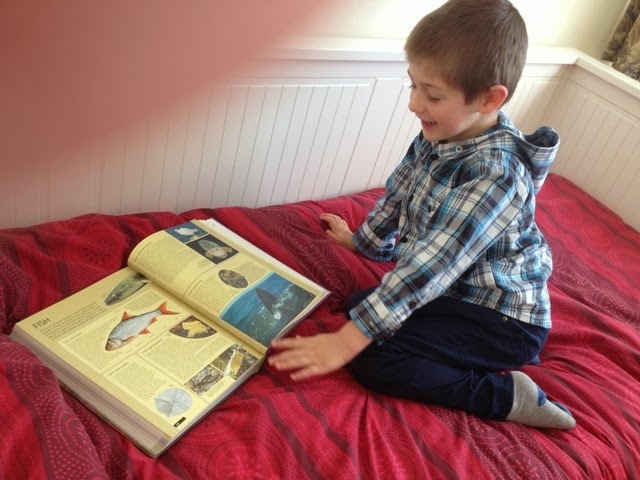 You need only examine the photos to have an inkling of the exquisite craftsmanship. The photos make me feel I would like to caress ‘Brina’, for that is the name he has given her. 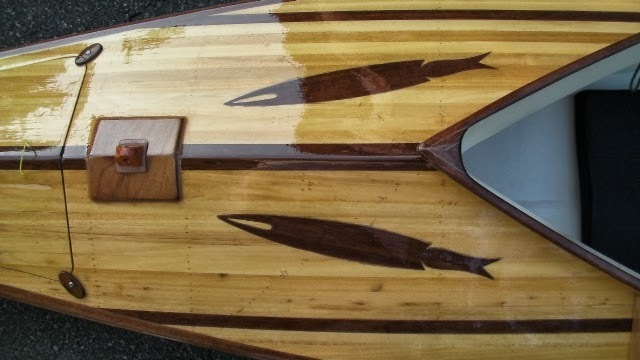 I would like to run my finger over her highly varnished deck. 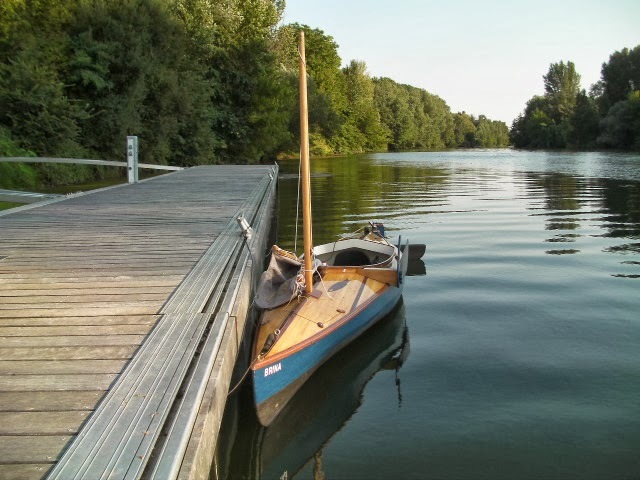 Furthermore I would like to sit in this beautiful craft, hoist her sail and take her for a spin. I’m flabbergasted by what Richard has done. I thought my ‘Caleb’ was well built, but when seen beside ‘Brina’, she looks plain and almost featureless. What excites me is that Richard will be building a Paradox. I’m convinced she will be a joy to behold and to own. Thank you Richard for sharing your photos, and thank you for giving permission to publish them. When will the painting end? I can’t be far away from completing it, but there could be more to do on the interior. 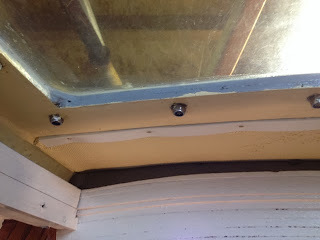 Today I painted the cabin top insulating foam for a second time. 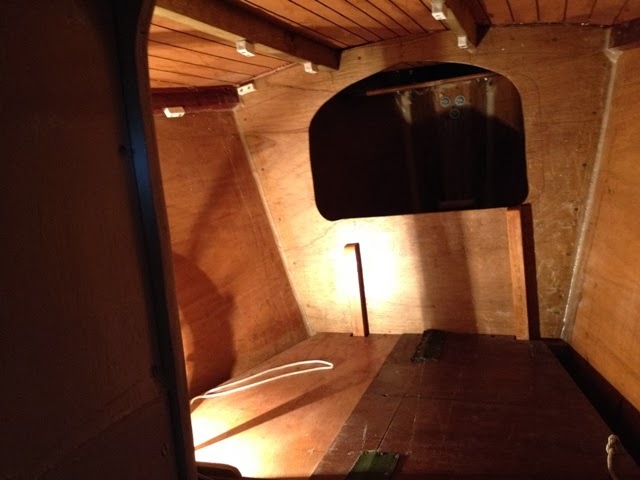 The magnolia paint brightens the cabin, and at night it will reflect light from the cabin lamp. I may not paint it again, but whatever I decide, I shall have to carefully remove the masking tape. I also painted under the support frame for the solar panel. 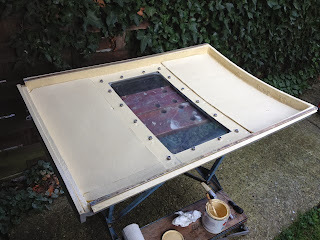 This will help seal and preserve the panel, but the poor finish I inherited leaves much to be desired. I may be able to improve it by sanding the surface before applying another coat of paint. To see the uneven finish, one has to get up close; therefore I’m not too bothered. The primary function of the paint is to seal the wood. I haven’t seen ‘Minnow’ today. She’s tucked away in the garage waiting for attention. Some days it has been possible for me to spend several hours working on her; other days I’ve been fortunate if I’ve had more than an hour for attending to her remedial needs. 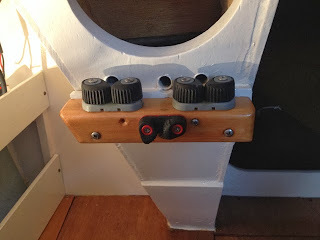 More recent articles featured here have centred on the renovation of ‘Minnow’, a Matt Layden Paradox sailboat; therefore you could be forgiven for thinking that most of my energy, thoughts and actions have been devoted to this needy creature. That is not a reflection of the truth. 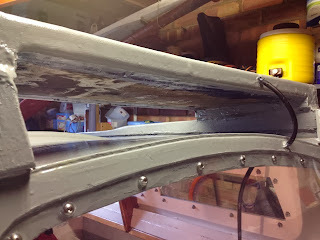 To keep the momentum going I have had to make positive efforts when I would far rather have rested or done something more worthy than wasting my time on bits of plywood held together with epoxy resin. 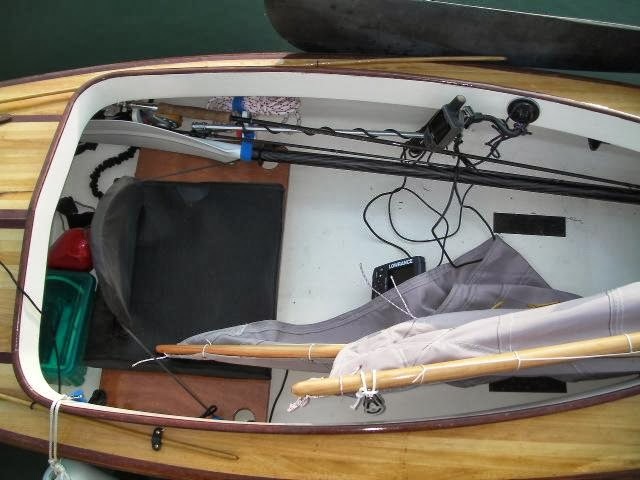 The fact is that working on the boat is not a waste of time. This is a subjective judgement, and in my case I know how good and profitable it is for me to be engaged in such a project. In between doing other things, the activity engages my mind, and exercises my body - You try crawling into the forecastle of a Paradox sailboat; turn on your back and try fixing electrical wiring to a battery or screw in place a block for a steering line, and you’ll agree that muscles not normally used to any extent are taxed to the point where rest is required because of pain or fatigue. Maybe you are younger than me, and perhaps such things are easy for you. But whatever the case, you know that eventually, all the effort will be worthwhile, because you will find joy and excitement sailing her in her new found state of seaworthiness. You imagine the adventures you may have, and of challenging encounters with Mother Nature. In your dreams you will see Nature’s beauty, taste and feel her riches; you will see your boat come to life when she bobs over the waves. Sun’s reflections will dazzle your eyes; rain’s droplets will moisten your brow until you’ve had enough and close the hatch. The boat sails on; only the soft hiss of wavelets can be heard as they run the chines and are transformed into channels of bubbles trailing astern. Then there’s the next horizon, the next headland and beyond. Who said it’s a waste of time!! Piece by piece, job by job, gradually ‘Minnow’ is being assembled. 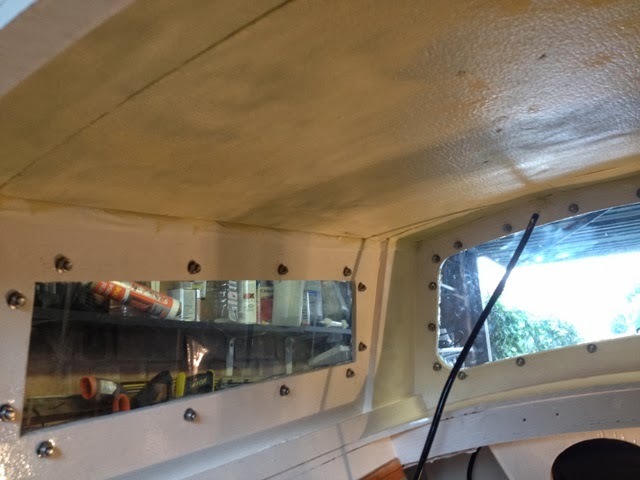 In preparation for fitting the sliding hatch I painted the underside of the hatch. I also painted the cabin headlining to change the colour from green to cream. I may give it a topcoat of magnolia paint. 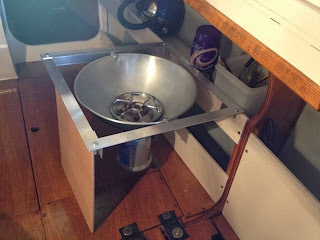 The same goes for the side linings, as I want the boat to be as attractive as possible for living aboard when cruising. 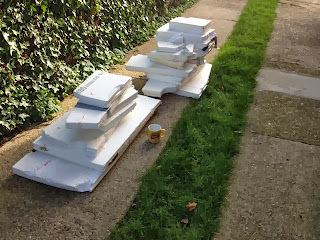 I’ve included a photo of the polystyrene I extracted from the boat. 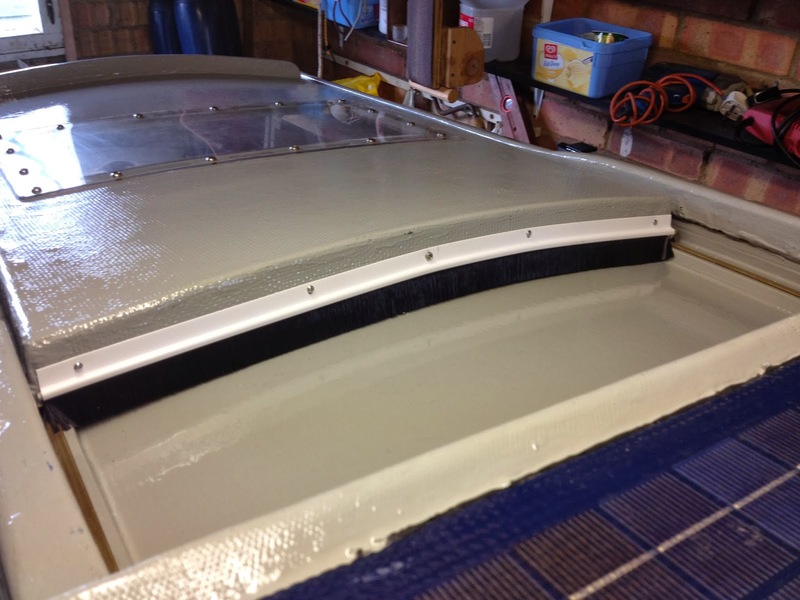 When Derek built ‘Minnow’ (Enuf) he incorporated enough polystyrene to keep her afloat in the event of severe flooding. Each to his own, but I never added internal buoyancy to ‘Faith’, believing the chances of her succumbing to being swamped were negligible, at least in the conditions and waters were I would be sailing. 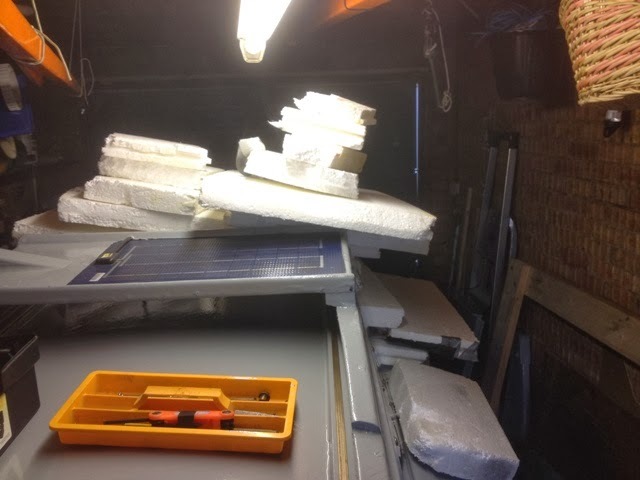 I was not keen on having a significant amount of space taken up by voluminous polystyrene, especially in the lazarette where Matt’s plans showed four bins made from plywood. 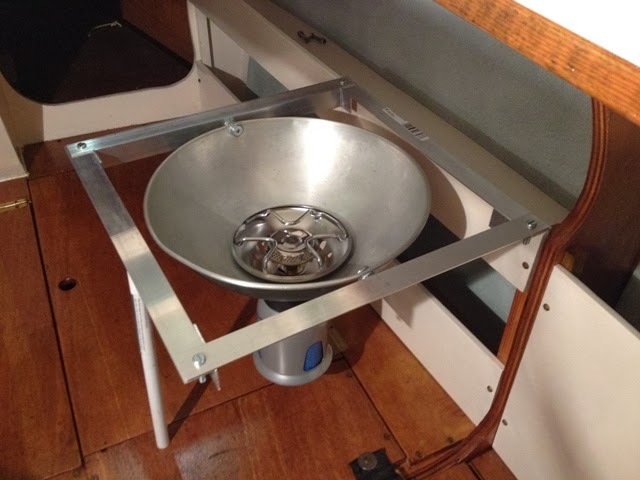 One of them was occupied by a gimballed stove; another was for an anchor, and the remainder were for miscellaneous items, perhaps warps and fenders. A characteristic of polystyrene that I dislike is that when rubbed, small pieces break off. These fragments appear to be charged with static electricity that causes them to have magnetic properties making them adhere to whatever they come into contact. In ‘Minnow’s’ case, I found loads of pieces lodged in the bilges. A significant factor that I had not considered was the flammable nature of polystyrene. Richard Green, who frequently contributes to this blog with useful comments, drew my attention to the added risk of rapidly spreading fire because of the polystyrene. He suggested I should test it to ascertain if it was flammable. The experiment demonstrated that it was very flammable and the flames produced a deadly black smoke - the sort that would have you unconscious in seconds! This convinced me I should remove all polystyrene from ‘Minnow’. Today, that was my task, and I’m pleased the mission was accomplished. My local Council advises that I can dispose of polystyrene in my non-recyclable waste bin. No doubt the Council’s rubbish collection workmen will get rid of it in the most environmentally friendly way. I shall be glad to see the back of it.